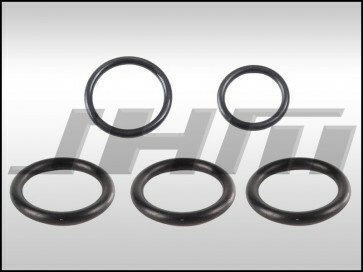 This is a complete O-Ring kit for the known to leak coolant pipes on the top end of your 2.7T motor found in the B5-S4-RS4 and the C5-A6-allroad with the 2.7T. - 3x N 905 607 01 - Two of these seals install on each side of the coolant cross-over pipe that connect to the rear of each head on the top of the motor. The third seal installs in the middle of the coolant cross-over pipe that connects to the hard pipe.